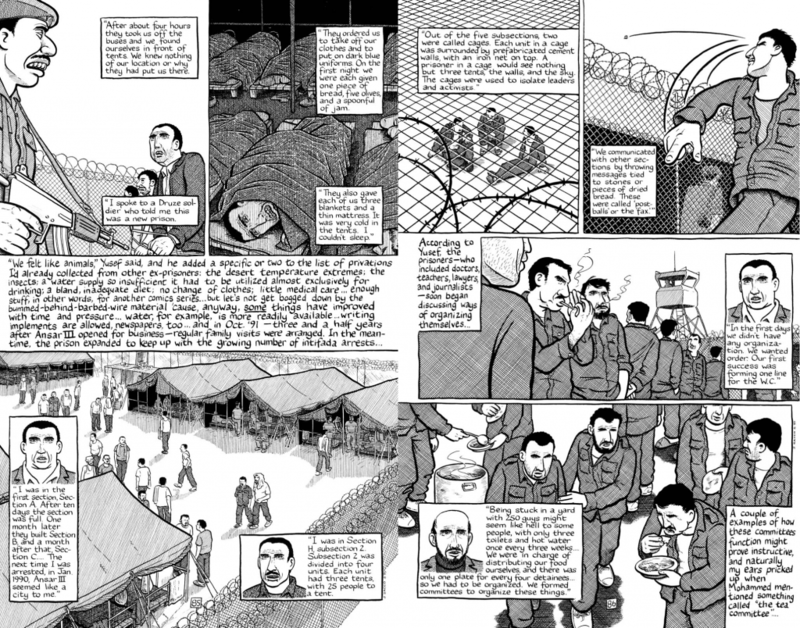 While it is possible to enjoy the book without having any background of the Israel–Palestine conflict—just the way I had read through the book when I bought my copy years ago—the understanding of this piece of work gets elevated once the reader is exposed to the context in which the narrative exists. Although the modern conflict in the region can be dated back to the Jewish Question in the nineteenth century and the subsequent exodus of the Jews from the European nations, the current incarnation can be traced to two specific things. The first one being a Zionist narrative derived from the Old Testament (Torah; Joshua 1:3) that somewhere got reinterpreted by Christian and Jewish Zionists in the following fashion—land without people for people without land. This radical interpretation hinges on the assumption that Palestine is a land without any inhabitants. The second one is the 1948 Arab–Israel War whose outcome was the victory of the Jews in Israel and the defeat of Palestinian Arabs—the latter being backed by Islamic states of Syria, Jordan and Egypt. The outcome led to the confinement of the Arab population in two prominent regions of Palestine, each of which would get influenced by their neighbouring countries—West Bank with Jordan influence and Gaza Strip with Egyptian influence. These areas are disconnected from each other. An ultra-brief history of the source of the conflict condensed in one page. 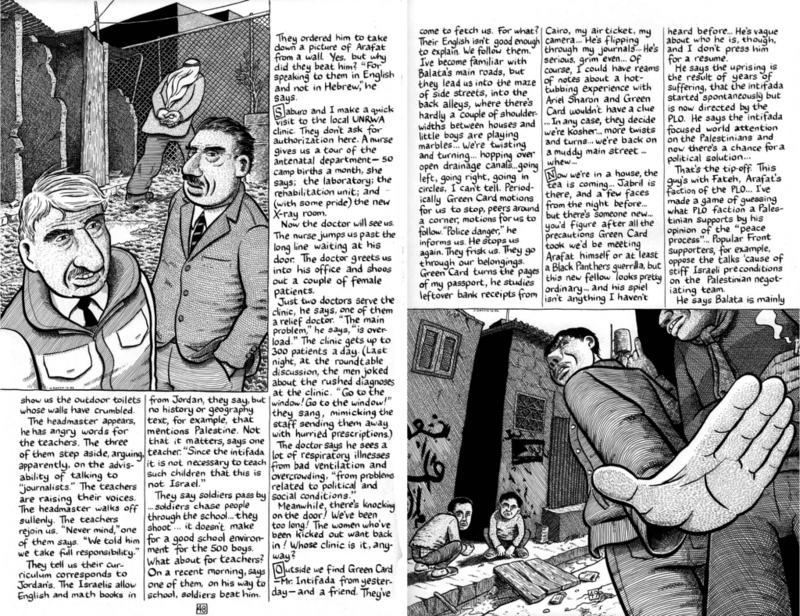 The comics chronicles Joe Sacco’s visit of Palestine between December 1991 and January 1992. This period was the fag end of the First Intifada—the Palestinian uprising against Israel between 1987 and 1993. Specifically, his visit was just after the Madrid Conference—the first attempt at any form of peace talks—that took place in November 1991. There wouldn’t be any concrete outcome until the conclusion of Oslo accords in 1993. These subsequent events aren’t documented. It might be worthwhile to know the two factions that were at each other’s throat. The Israelis had Shin Bet—their Security Agency—while the Palestinians had UNLU (Unified National Leadership of the Uprising)—a grass-root coalition of local political factions. The latter’s organic structure was a stark contrast to the former’s structured military system. The reader would encounter a lot of reference to PLO (Palestinian Liberation Organisation). PLO is a political coalition that aimed at liberation of Palestine using armed struggle. Their main faction is called Fatah. A few communist groups are also part of the PLO–coalition. UNLU, during Intifada, borrowed a lot of resources from PLO as well as competing political entities like Hamas and Palestinian Islamic Jihad. Post Oslo Accord, PLO was the de-facto authority of the Palestinian territories to the outside world. The first half of the book covers Sacco’s explorations in the West Bank while the latter half documents his trips to Gaza Strip. It is interesting to note that certain orthodox cultural elements—most of which concerns roles and expected behaviours of women—take prominence in the latter half of the narrative. Another point to note would be that the orthodox Hamas got into conflict with PLO sometimes later in 2006. Subsequently they took over the control of Gaza Strip. This event would lead to splitting of Palestinian Authority. UN’s involvement in the peace process was via UNRWA—the largest agency of UN whose sole job is to provide amenities to the settlements and refugee camps in Palestinian territories. They have been operating in the region since 1949. They have no authority. On top of that, they have been criticised of having very rigid systems in place—a by-product of their long existence in a political deadlock. With each passing year, the bureaucracy increases and their ability to address real problem decreases. That was a good-enough background. It is hard to condense some key elements of a complicated conflict into five or six paragraphs. Luckily, Joe Sacco focuses on individual events. The book comprises of nine chapters, each of which consists of smaller stories. These stories are varied in nature. Some try to capture the details and anecdotes from interviews, some focus of the author’s first-hand experiences while others are silly jokes that poke fun at the not-so-silly aspects of the conflict. As I read through the chapters, the transformation of the narrator became very apparent. In the first few chapters he appears to be aloof—almost disinterested in the conflict—focusing instead on petty thieves, cheats and haggling shopkeepers to drive comedy through adversity. These are tertiary effects of the real problems. His subject matter in the earlier stories are common elements of any displacement-driven conflict—poverty, oppression, lack of amenities, protests, demonstrations, etc. This is how the first chapter ends! 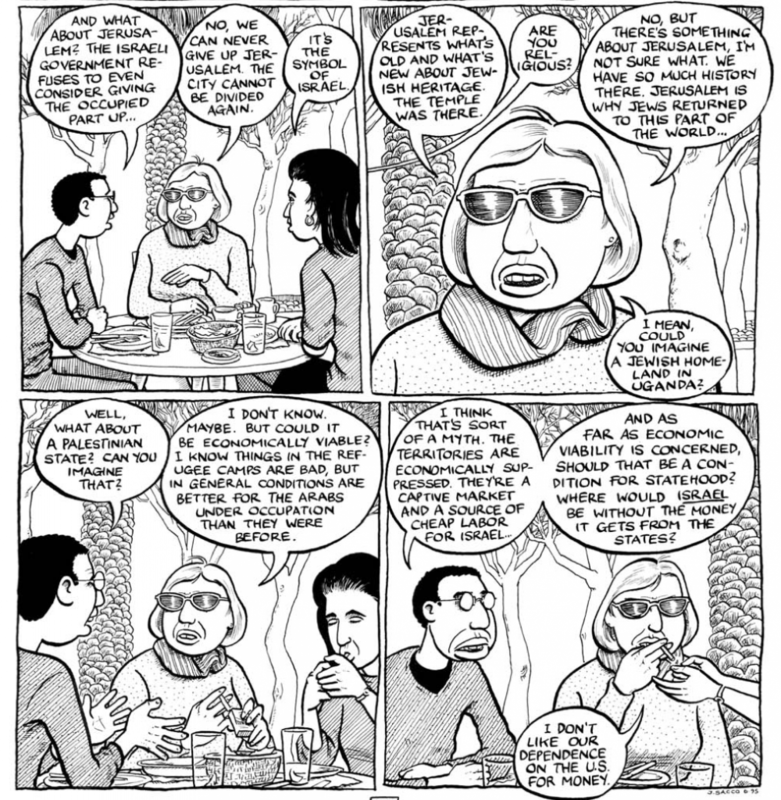 The comics—and thus the narrator—doesn’t sink its teeth into the crux of the conflict until the third chapter. Specifically, not until Subaro—the photojournalist—joins him in his mission. Post that it becomes an exploration of human condition. First in West Bank and then in Gaza Strip. The exploratory narrative is constructed through the stories of the survivors, the mourners, the helpers, the oppressed. Occasionally, comical elements crop up, often driven by his first-world libertarian upbringing juxtaposed to the orthodox, patriarchal, Islamic culture of Palestine. His stance towards the conflict changes gradually as the narrative progresses. By the final chapter, we find him arguing against the viewpoints of two affluent Jewish women in Jerusalem. These are the people who know little of the ground reality and are quick to state their opinion, most likely a result of selective media exposure. Sacco arguing with the ladies. The art style of the book is very consistent. The layout and transition style is not. 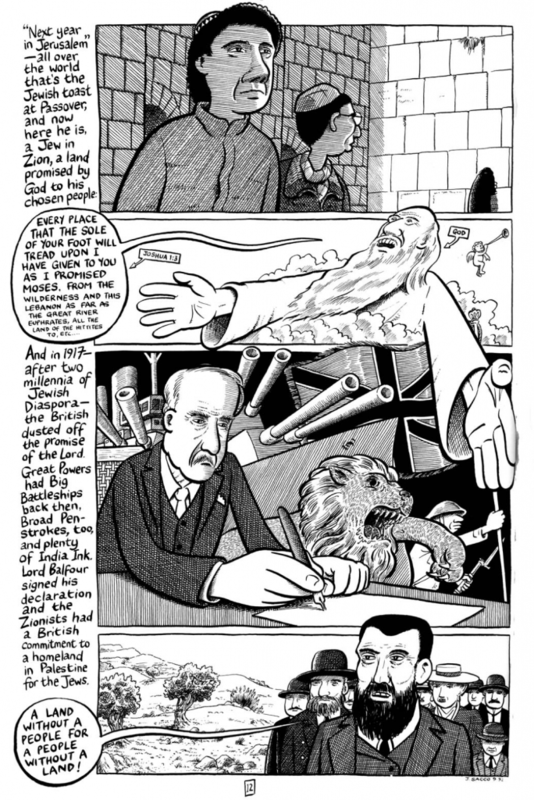 Throughout the comics, Joe Sacco uses some unconventional layouts that break away from the traditional box-panel structure of comics. The story Remind Me from chapter two uses an imitation of journal article—one that the reader might encounter in a magazine like National Geographic. This story—Ansar III—from chapter four uses a voiceover technique. This flow of visual and textual information is almost like an imitation of video documentaries. Then there are stories like Ramallah in chapter five that break all conventional layout and reading order—almost like the chaos depicted in the narrative. And there are stories like these—Pilgrimage from chapter eight—where Joe Sacco demonstrates extreme discipline in his layout. It might be worthwhile to have a look into the current map of Israel and Palestine. 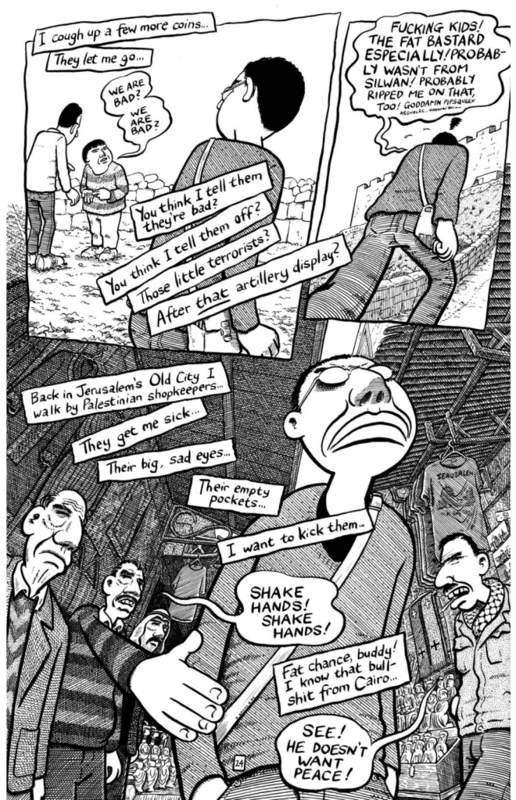 Joe Sacco visited quite a few places in Palestine. 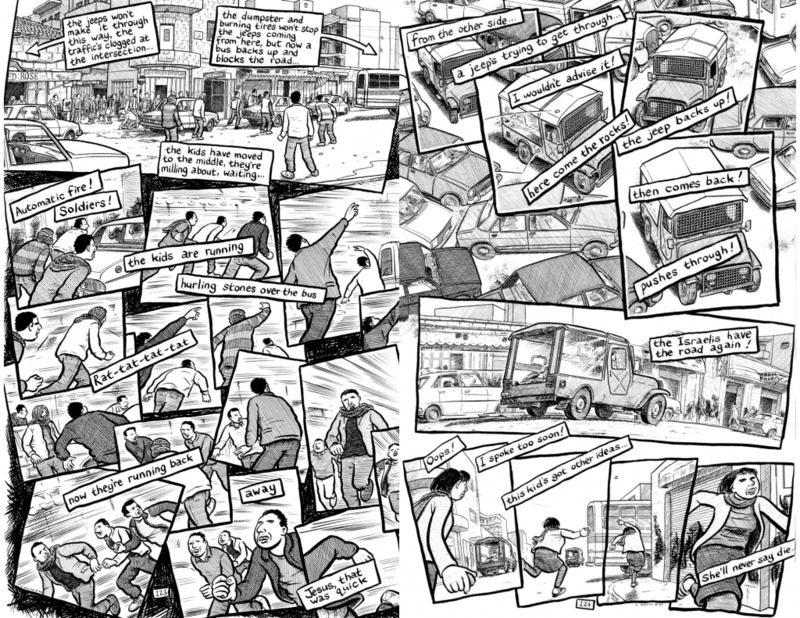 Knowing their relative location and connectivity would help the reader visualise his journey and give context to some of the hardships he faced with transportation. Reading through the book had definitely piqued my interest in the Israel–Palestine conflict. It compelled me to do some background research on the conflict. What I found hard to grasp was the fact that while nativist and racist ideologies had displaced Jews from Europe during World War II, it was a similar set of ideologies that made the Jews displace Arabs from Israel right after the War. 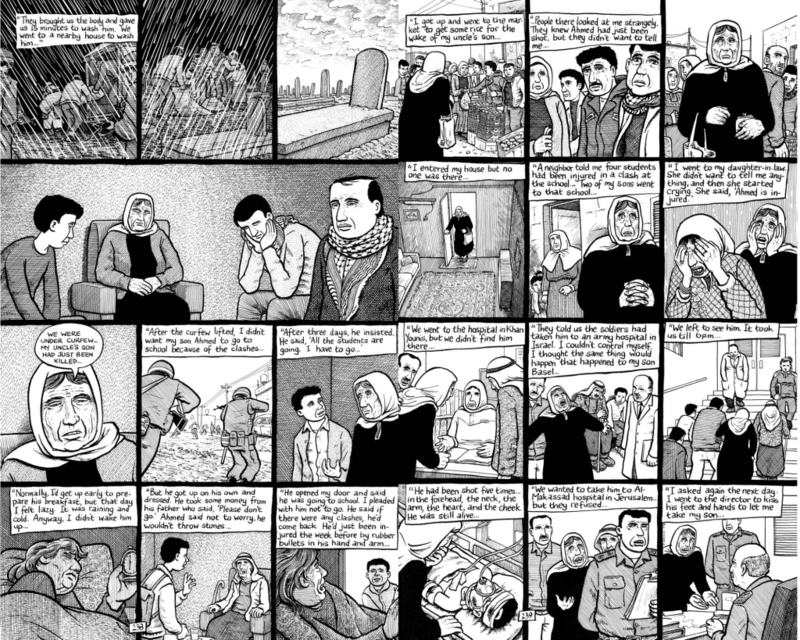 I haven’t come across anything similar to Palestine in the comics medium. There are autobiographical narratives that focus on certain periods in the historical evolution of a country (Showa or Persepolis). However, there aren’t that many works in the comics medium that approach a set of events from a journalistic point-of-view. That way, Joe Sacco’s treatment of the subject matter is quite unique.